The Haçienda was a nightclub and music venue in Manchester, England, which became famous in the Madchester years of the 1980s and early 1990s. The Haçienda opened in 1982, and despite considerable and persistent financial troubles survived until 1997—the club was mainly supported by record sales from New Order. The Haçienda is associated with the rise of acid house and rave music. A wide range of musical acts appeared at the club. One of the earliest was the German EBM band Liaisons Dangereuses, which played there on 7 July 1982. The Smiths performed there three times in 1983. It served as a venue for Madonna on her first performance in the United Kingdom, on 27 January 1984. She was invited to appear as part of a one-off, live television broadcast by Channel 4 music programme The Tube. Madonna performed "Holiday" whilst at The Haçienda and the performance was described by Norman Cook (better known as Fatboy Slim) as one that "mesmerised the crowd". Although security failures at the club were one of the contributing factors to the club eventually closing, the most likely cause was its finances. The club simply did not make enough money from the sale of alcohol, and this was mainly because many patrons instead turned to drug use. As a result, the club rarely broke even as alcohol sales are the main source of income for nightclubs. Ultimately, the club's long-term future was crippled and, with spiralling debts, The Haçienda eventually closed definitively in the summer of 1997. Peter Hook stated in 2009 that The Haçienda lost up to £18 million in its latter years. The Haçienda lost its entertainments licence in June 1997. The last night of the club was 28 June 1997, a club night called "Freak" featuring DJs Elliot Eastwick and Dave Haslam (the final live performance was by Spiritualized on 15 June 1997). The club remained open for a short period as an art gallery before finally going bankrupt and closing for good. 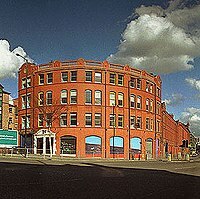 After The Haçienda officially closed, it was used as a venue for two free parties organised by the Manchester free party scene. One of the parties ended in a police siege of the building while the party continued inside. These parties resulted in considerable damage and the application of graffiti to the Ben Kelly-designed interior. Following a number of years standing empty, the Whitworth Street West site was purchased from the receivers by Crosby Homes. They chose to demolish the nightclub, and reuse the site for the construction of domestic flats. The iconic name was kept for the new development, with The Haçienda name licensed from Peter Hook, who owns the name and trademark. The nightclub was demolished in 2002—Crosby Homes had acquired the property some time before that and, on Saturday 25 November 2000, held a charity auction of the various fixtures and fittings from the nightclub. Clubgoers and enthusiasts from across the country attended to buy memorabilia ranging from the DJ booth box and radiators to emergency exit lights. The DJ booth was bought by Bobby Langley, ex-Haçienda DJ and Head of Merchandise for Sony Music London for an undisclosed fee. Crosby Homes were widely criticised for using The Haçienda brand name—and featuring the strapline "Now the party's over...you can come home" in the promotional material. Another controversial feature of the branding campaign was the appropriation of many of the themes which ran through the original building. One of these was the iconic yellow and black hazard stripe motif which was a powerful element in the club's original design, featuring as it did on the club's dominant supporting pillars and later in much of the club's literature and flyers. Michael Winterbottom's 2002 film 24 Hour Party People starring Steve Coogan as Tony Wilson, tells the story of The Haçienda. The film was shot in 2001, and required reconstructing The Haçienda as a temporary set in a Manchester factory, which was then opened to ticket holders for a night, acting as a full-scale nightclub (except with free bar) as the film shooting took place. ^ "Hacienda exhibit at D-mop", hongkonghustle.com. 7 October 2007. ^ a b 25 Year Party Palace. BBC. Retrieved 2 February 2008. ^ a b Glinert, Ed (2008). The Manchester Compendium: A Street-by-Street History of England's Greatest Industrial City. Penguin UK. ISBN 978-0-14-102930-6. ^ Brewster, Bill; Broughton, Frank (2000). Last night a dj saved my life: the history of the disc jockey. Grove Press. p. 345. ISBN 978-0-8021-3688-6. ^ Donohue, Simon. Madonna Forgets Haçienda Visit". Manchester Evening News. Retrieved 2008-02-03. ^ Tim de Lisle (23 November 2005). "'She mesmerised the crowd – you could just tell there was a personality there'". The Guardian. Retrieved 13 February 2010. ^ Connors, Rachael (27 July 2015). "Paul Massey death: Who was Salford's Mr Big?". BBC News Online. Retrieved 27 July 2015. ^ Collin, Matthew; Godfrey, John (1998). Altered state: the story of ecstasy culture and Acid House (2nd ed.). Serpent's Tail. p. 160. ISBN 978-1-85242-604-0. ^ Harking back to the Haçienda. BBC News. 6 November 2000. ^ "Peter Hook: 'Hacienda lost £18m'". BBC News. 2 October 2009. Retrieved 11 February 2012. ^ Stuart Aitken (March 2004). "Making a hash of the Haç". mad.co.uk. ^ "FAC 51 The Hacienda Limited Edition Peter Hook Bass Guitar". Archived from the original on 25 December 2016. ^ Ben Turner (12 January 2013). "Peter Hook's gig with bass guitar made from Hacienda floor". manchestereveningnews. ^ Rick Bowen (13 June 2013). "Altrincham shop lands rare guitar". messengernewspapers.co.uk.